Leaves, seeds for pressing oil. Moringa is a tree that has been used for thousands of years in India for everything from food, to building materials, and also for its beneficial properties. This 'wonder tree' truly is wondrous in that each part of the tree is useful. The roots, stems, leaves, seed pods, resin and flowers are considered to be healing herbs in Ayurvedic (traditional Indian healing system) and Unani (traditional Middle Eastern healing system) folk medicine. In modern times, the leaves and seed pods are utilized extensively due to their nutrient content and modern studies are investigating their vast potential. Moringa is native to the sub Himalayan mountain region particularly in India and has been introduced to southwest Asia, southwest and northeast Africa, Madagascar, the Philippines, and in the United States in California, Arizona, Hawaii and Florida. This tree is in the Moringaceae, or horseradish tree, family which is closely related to the papaya containing Caricaceae family. It is the sole genus, containing thirteen species one such species being M. stenopetala, a species native to and cultivated in Africa. The generic name is derived from the Tamil (language spoken in southern India and northeast Sri Lanka) word 'murungai' meaning twisted pod. And 'oleifera' is Latin meaning 'oil-bearing' due to the seeds high oil content. Moringa is drought tolerant and thrives in semi-arid, tropical, and subtropical climates and is one of the most commonly cultivated food plants in the world. It is grown in India, Pakistan, Africa, the Philippines, and the Caribbean. Further, it is cultivated in various countries in Central and South America because it is easy to grow and has high market potential, therefore potentially providing an alternative to deforestation. It is also cultivated extensively in African countries to feed their own malnourished populations. It is believed that the moringa tree originated in northern India and was being used in Indian medicine around 5,000 years ago, and there are also accounts of it being utilized by the ancient Greeks, Romans, and Egyptians. This tree was, and still is, considered a panacea, and is referred to as the 'The Wonder Tree', 'The Divine Tree', and 'The Miracle Tree' amongst many others. Moringa was used extensively in Ayurveda, where virtually all parts were considered useful with a plethora of beneficial attributes. It was employed to support digestion, spleen and eye health, as a cooking additive, and in many other ways. Its taste was considered bitter and pungent; its energetics, heating; and its effect upon the dosha (Ayurvedic constitutional type) are balancing to Kapha (dosha ruled by earth and water) and Vata (dosha ruled by air and ether). The whole tree has been used for erosion control and for building materials to provide shelter. The seed is high in oil, and the fibers remaining after oil extraction are one of the best plant-derived flocculants (clarifying agents) for clarifying water. Further, the roots are believed to taste like horseradish and are thus used as a condiment. Additionally, the flowers are eaten in omelets. The leaves have an extremely high nutrient value and are dried and powdered and put in sauces and baby formula. A beverage is made from the leaf, either as a standard tea or as a type of reconstituted dried leaf juice. In India, the immature seed pods (known as drumsticks) are eaten like asparagus. Further, a nutrient dense formula made from the leaves is sprayed on plants in South America in order to boost corn yields. Moringa grows in countries where 5% to 35% of the population is suffering from malnutrition. According to one organization working towards feeding malnourished populations called Trees for Life "Amazingly, moringa grows in subtropical areas, where malnutrition is most prevalent. It was as if people had a goldmine in their backyard and simply didn’t know it." 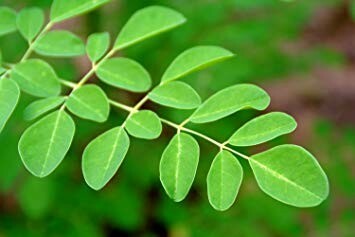 Many groups are supporting the cultivation of moringa for personal use in developing countries, suggesting that each person grows two or three trees in their backyard thus providing a sustainable solution to malnutrition and reducing reliance upon imported foods. Another such group, called Educational Concerns for Hunger Organization or ECHO states: "Malnutrition is a leading cause of high infant mortality throughout the tropics. Moringa has helped in bringing nutrition to these hungry children (and)….it is considered one of the most nutritious vegetables in the world. It is an important nutrient source for nursing mothers as well as developing children." Dried leaf as an additive to foods to increase nutritional value, or as a tea or juice. Perhaps moringa really is a miracle tree..? Not only has it provided food, shelter, water filtration, and medicine, but it may also be a source for fuel in the future. Moringa is being considered as potential source for biodiesel (plant based fuel that diesel engines can run off of). This plant grows easily in tropical areas and can easily produce high quantities of biomass for fuel. This can be done without compromising leaf harvest, thus the same moringa plant can be cultivated for both fuel and as a nutritional supplement for the natural marketplace simultaneously. It is therefore considered a superior feedstock to jatropha (Jatropha sp.) which is commonly grown for biofuel.